PS. You might find this amusing given the circumstances! Welcome to the lasered eye club! PS See how long it takes you to stop pushing your specs up the bridge of your nose. Get better soon! It's awesome! Welcome to our club, it's the best one to be in......but I do get sick of Lovely Hubby asking me what time it is in the morning because he can't see the clock until he puts his contact lenses in!! Congratulations, even though as you say, you're sore at the moment, this will be SO worth it! 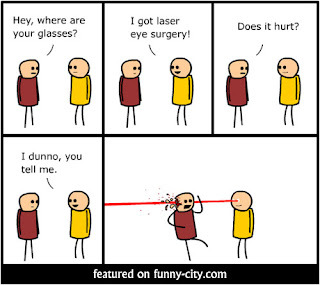 Feel better soon, my hubby loves his laser surgery after a few days. Buy yourself a super cute pair of sunglasses as soon as you are up and around!!!! I hope you are quickly on the mend, Mrs. T. Best to you! Hi there! Just found your blog and really enjoy it! Hope you feel better soon! Hope you feel better really soon, what a wonderful thing to do! Hope you're on the mend! Sime's dad had it done & didn't need to wear his glasses any more - after about 50 years of wearing them! I hope you are happily on the mend! Everybody I know who has undergone laser treatment comes out grinning after a few days. I am sending you smiles and happy thoughts from France. I wouldn’t recommend you staying in front of the television or your computer hours after your surgery. But it seems you couldn’t hinder yourself from doing so. Anyway, I know it’s been months from your surgery, but you should still protect your eye like the surgery was just yesterday. 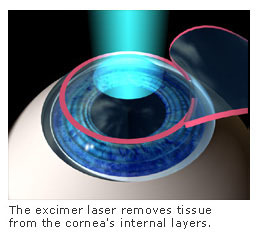 Keep up all your post-Lasik surgery appointment for continuous progress.